New York City Mayor Michael Bloomberg - one of the richest men in the world, and a guy who has risen to the top in at least four different occupations so far - is ready to try on a new hat. Bloomberg - who was a partner at the Wall Street firm of Salomon Brothers, founded his own business information technology empire, segued into the news business and politics, and has made a name for himself as a philanthropist - is going to try his hand at acting. It might be argued that Bloomberg - in a city filled with actors looking for work - had a bit of an unfair advantage in landing the job, but he probably won't pose much competition when it comes to the Emmy awards. The mayor will be playing himself. Bloomberg will appear on the long-running "Law & Order" television drama, which taped two scenes inside the Blue Room in City Hall on Wednesday. Bloomberg, known more for his sometimes stilted syntax than for any acting chops, will be seen at a pair of news conferences discussing the murder of an assistant district attorney. "`Law & Order' has been produced in New York City for the last 14 years, and the mayor is looking forward to welcoming the cast and crew to City Hall," said Bloomberg spokesman Ed Skyler, in a statement issued earlier in the day. 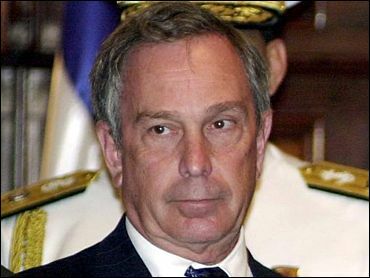 Bloomberg's foray into method acting won't go unrewarded: he'll be paid $678, per Screen Actors Guild rules. Skyler says the billionaire mayor, who accepts just $1 a year to run the city, will donate his TV paycheck to a fund for the families of deceased police officers and firefighters. The air date of the episode hasn't been announced yet.